What's the efficient algorithm to find the Integer square root of a very large number, digit by digit? I need to write program to find the integer square root of a number which is thousands of digits long. I can't use Newton Raphson as I don't have data types to store and divide such large numbers. I am using a long array in C to store the number. 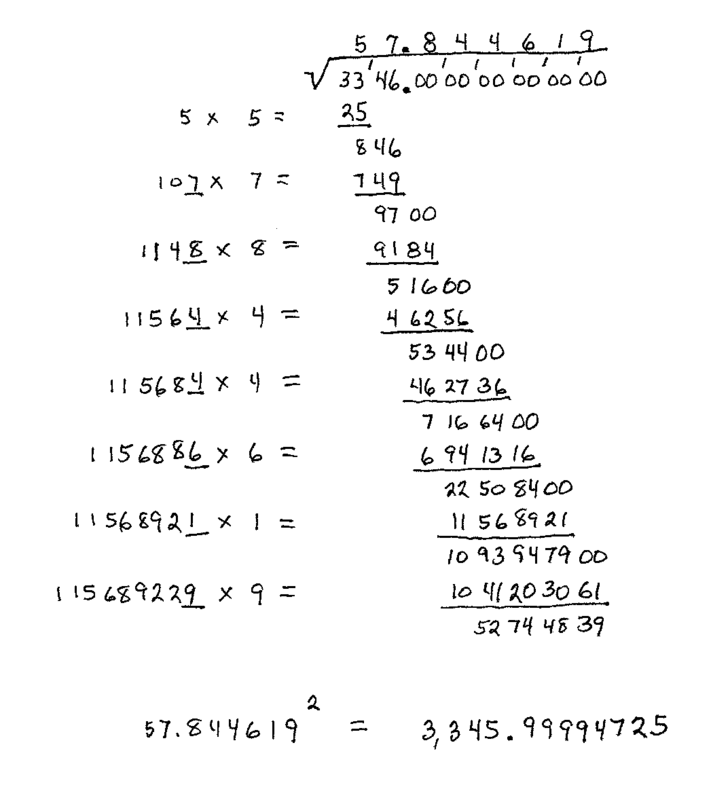 Is there any algorithm to find the square root by maybe iterating over the digits? I can't use external library like GMP. You can implement long division method to compute square root which is being taught at school. You can implement this method for base 10 and the result is computed digit by digit from left to right. You can stop once integer part is calculated. If you can input the target number, then you must have a way to store at least one such large number. For Newton-Raphson you only need to be able to halve and add numbers. Think of a way to halve a number without using division. ETA: Correction: division can be avoided by doubling and subtraction. You seem to have a lot of very unrealistic constraints on your 'bignum' implementation. I might suggest a binary search? At each iteration, find the 'half-way' value mid = (hi + lo) / 2, and prune the search space as [hi, mid], or [mid, lo] depending on the square of those values. Not the answer you're looking for? Browse other questions tagged c algorithm square-root integer-arithmetic or ask your own question. Fastest way to get the integer part of sqrt(n)? What's a good algorithm to determine if an input is a perfect square? Finding square root without using sqrt function? What is an efficient algorithm to find all the factors of an integer?